Evaluation Setup: I used my Squier USB guitar to plug directly into the iPad, eliminating any analog to digital conversion mechanism from the signal chain. Sounds were evaluated using Bose headphones to eliminate ambient distractions. Listening to guitars through headphones has always struck me as somehow wrong, but condo dwellers can’t be picky. 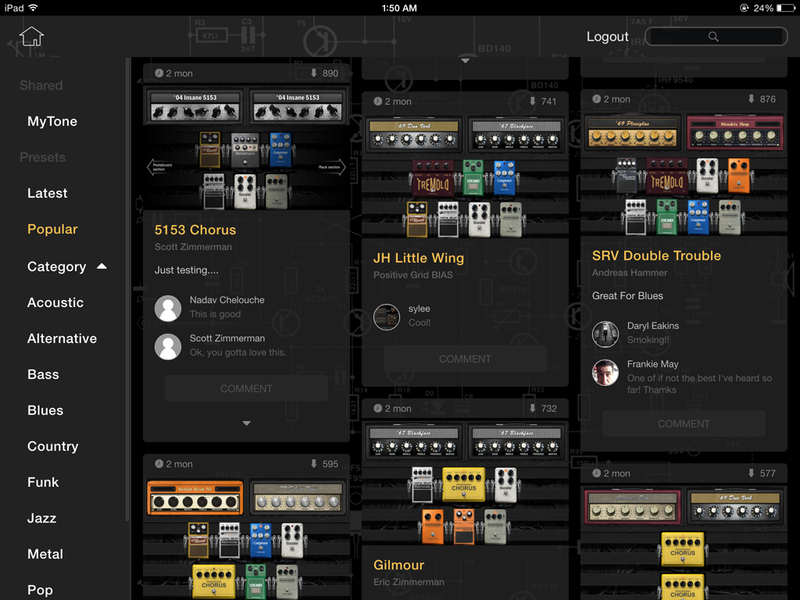 After plugging in the guitar and headphones, I launched the BiasFX app. After a brief look at the stylish splash screen, the primary working interface was shown above. Finding my way around the app: This app packs a LOT of functionality into an extremely intuitive user-interface. The currently-defined signal chain is displayed as a left-to-right linear layout of components at the top of the screen. Individual components in the chain can be selected by tapping on them. In the example picture, the amplifier sim has been selected. The app uses a skeuomorphic UI metaphor that is instantly recognizable and fundamentally intuitive to guitarists. 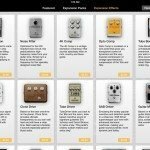 Amps, stomps, and racks are modeled in the UI as individual components, with adjusting controls that simulate real devices – amps have potentiometers, toggles, and buttons. 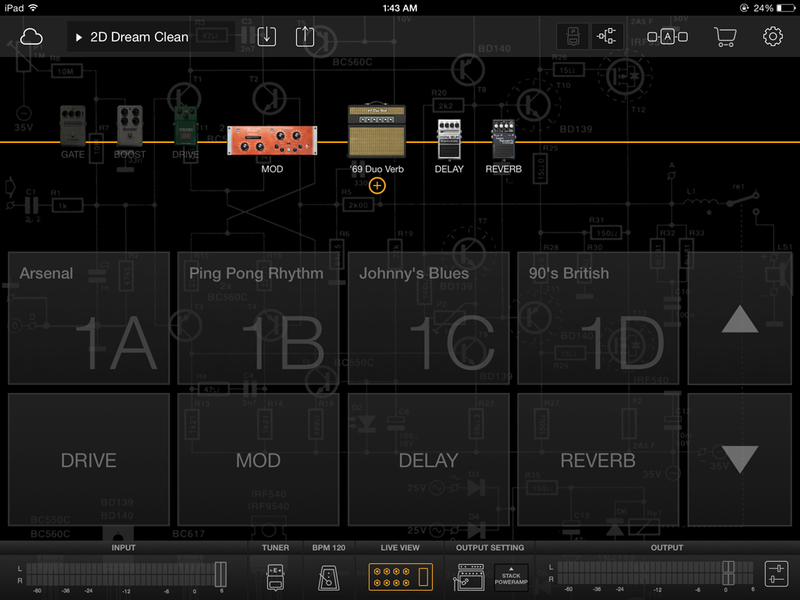 The app is delivered with 32 presets, ranging from “Dream Clean” to “80’s Metal” to “60’s Psych”. As with most such systems, the names are a general indicator of sound, but the only way to really get familiar with the possibilities is to plug in and play. 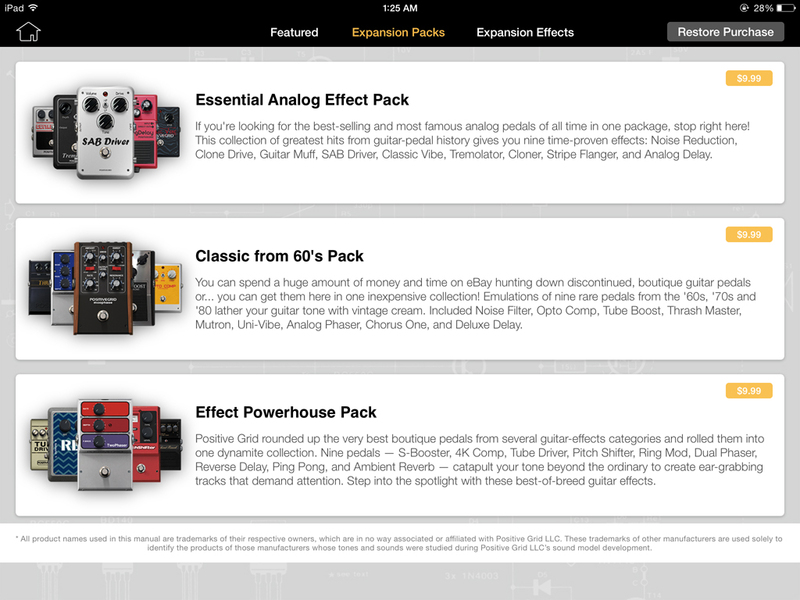 Selecting a preset is as simple as tapping the drop-down in the upper-left corner of the app. Components in the signal chain can be rearranged and edited via simple UI gestures. Tap a component to select it, then use the component editor at the bottom of the screen to edit the parameters. Select the component and drag it left or right to rearrange the components in the signal chain. Select the component and drag it off the chain – a trash can icon will appear at the left of the screen. Drop the component on the trash icon to remove it from the signal chain. Double-click any component in the chain to replace with a similar category component. Click the plus button to the right of the screen to add a new component to the chain. Components are grouped by effect type (gate, compression, boost, drive, equalization, modulation, delay and reverb). Each effect category has multiple components within that category. 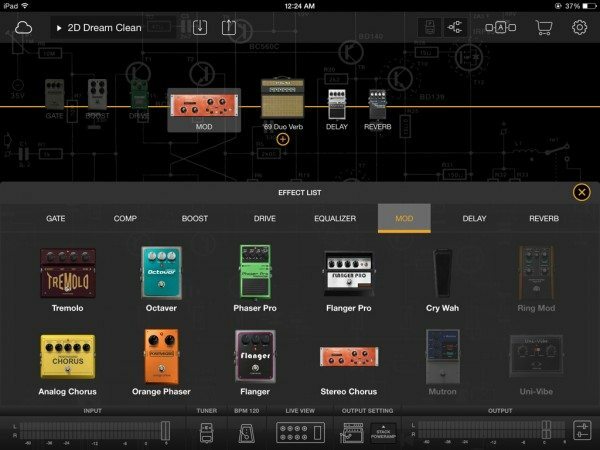 Without naming brands, many of the stomps and racks are simulations of classic devices that will be recognizable to guitarists. 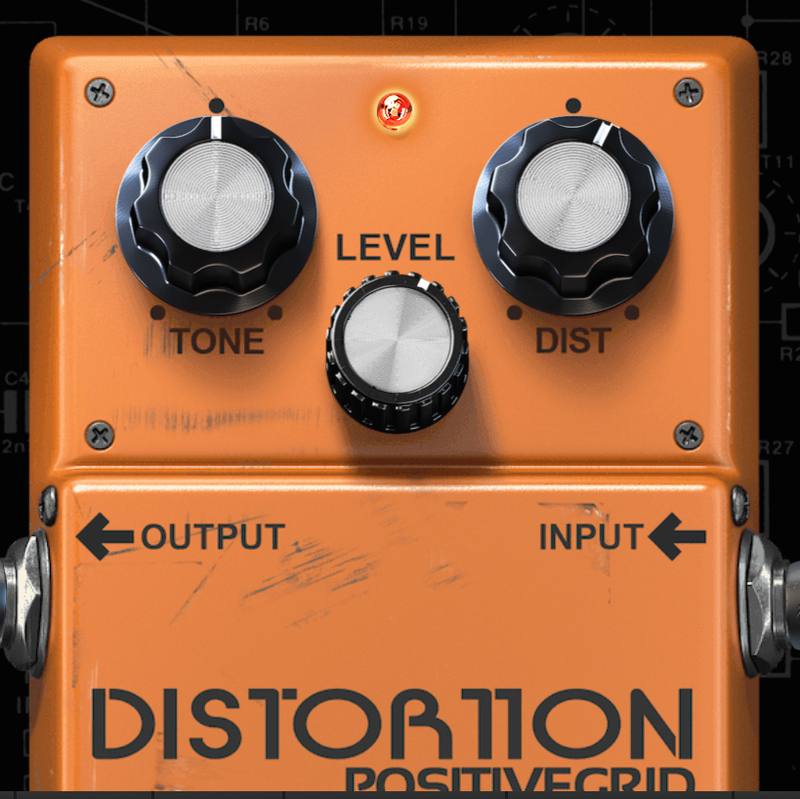 The image above shows an example distortion simulation from the Drive category that most guitarists have seen before. This is true of many of the included components – it was a somewhat nostalgic experience to cycle through all the included effects, trying to remember the brand and name of the stomps, flashing back to my college days when I could only moon over these devices in the music store. To adjust the pots on the individual components, tap the pot and drag upward to rotate clockwise, downward to rotate counter-clockwise. Tap toggles once to toggle them on, again to toggle back off. All components can be turned on and off (like real devices) while still remaining in the signal chain. 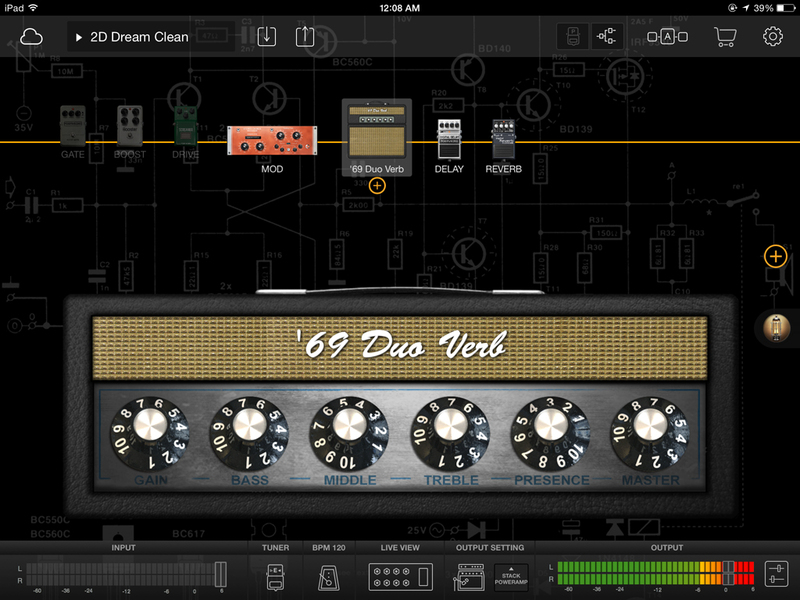 The “Dream Clean” preset includes an amp component (the ‘69 Duo Verb’ component). Note that this particular component has a plus sign icon under it on the signal chain. Tapping the plus sign invokes one of the differentiating pieces of functionality for this app: dual signal chains. When the icon is tapped, the signal will be split into left and right channels, allowing for channel-level customization. This image shows the result of clicking the plus sign to split the signal chain, then selecting a separate amp model for one channel. This singular capability opens up whole new worlds of options for tone shaping. When presets are chosen, any edits to the individual components, including adding/removing components from the signal chain, are not persisted. A save option is provided if you want to make your changes permanent. A “restore to factory defaults” option is also provided if you want to get back to where you started. Continuing around the main screen, at the mid-upper right of the screen are two toggle icons that let you select either the signal chain view or the pedal board view. The former (which you’ve already seen) shows the full signal chain at the top, and the selected component at the bottom. The latter shows all of the components in the preset at the same time. Individual components can be zoomed by double-tapping, and edits can be made while zoomed. The next icon allows interaction with other audio apps installed on the iPad. The shopping cart icon opens an interesting panel within the app. The panel has three tabs, “Features”, “Expansion Packs” and “Expansion Effects”. The latter two are relatively self-explanatory, allowing in-app purchases for additional individual effects, or in groups of effects called expansion packs. The “Features” tab, however, is noteworthy in that it allows the app producers to provide curated content. Most of this content appears to be celebrity endorsements, videos, and references to celebrity patches or presets that are available on the sharing cloud for the app (more on this later). The final button on the top row are the application settings. This small panel contains the normal array of audio setup functions. The bottom row of the primary panel has controllers for input and output levels, tuner, metronome, and output settings. These utilities are largely self-explanatory, and all work well for their intended function. The “live view” display warrants particular callout. This view presents the current set of presets (both factory and user-defined presets) in a large format grid view, with large, easy to use navigation buttons. This setup works incredibly well for live performance, allowing the musician to quickly move between presets, while still showing the signal chain for visual feedback. The cloud icon in the upper left corner connects you to Tonecloud, Positive Grid’s social community for sharing presets built in BiasFX. Usage of the cloud requires an initial signup, but once done, access within the app is seamless. Tapping the cloud icon opens a Tonecloud view within the app. The presets shared by other users can be searched, displayed by Latest, Popular, or category, then selected and downloaded. 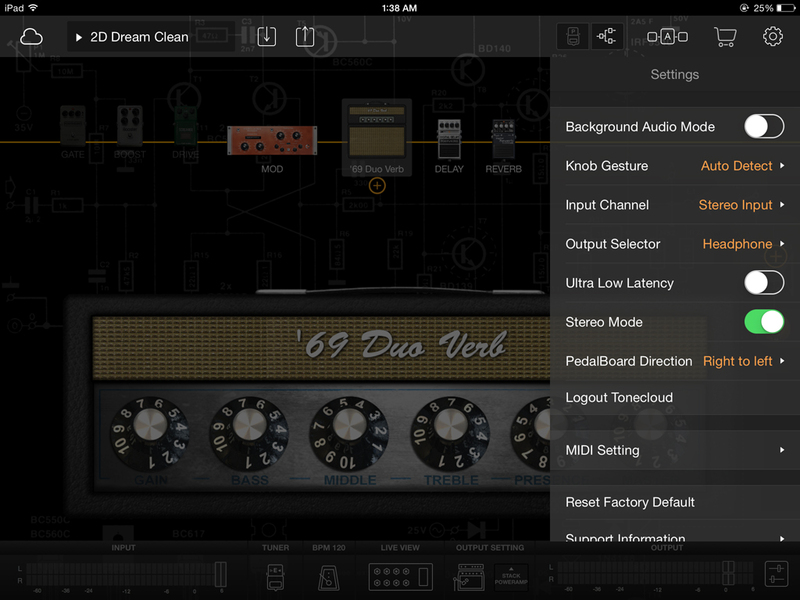 I found some amazing tones on Tonecloud, including the “5153 Chorus” preset shown in the above image. All of this wonderfully intuitive functionality is great, but the generated tone is what makes or breaks an app like this. So how does it sound? The only word that comes to mind is “awesome”. Understand, I don’t use this word lightly – in fact, most of the time I dislike intensely the way this word is overused. But I chose this word carefully, and it expresses precisely what I wish to convey. I was blown away and yes, awestruck, by the quality and diversity of tones generated by this app. 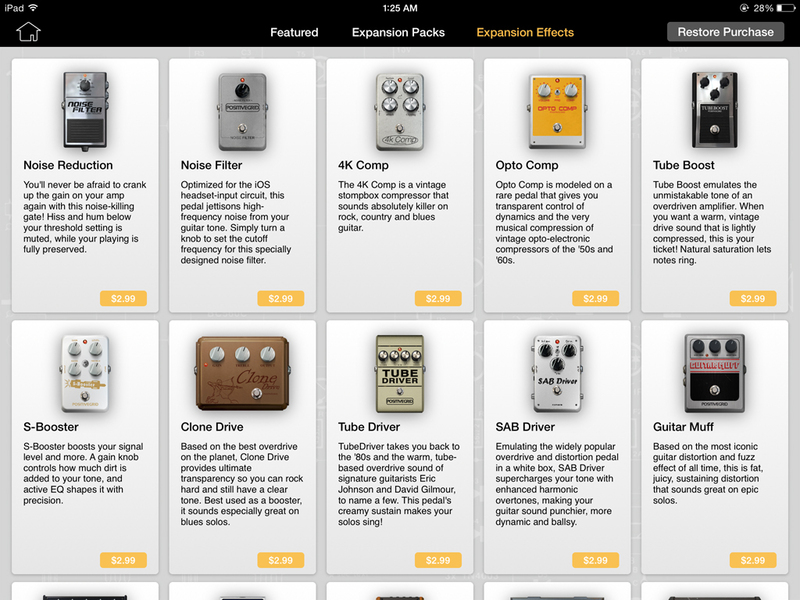 The app landscape for iOS guitar effects and signal processing is crowded with excellent products. Positive Grid, the maker of this product, has previously impressed with apps like JamUp, but in my opinion, this product leapfrogs the competition (and their own previous efforts) to set a new standard for ease of use, versatility and, most importantly, sonic tone quality. 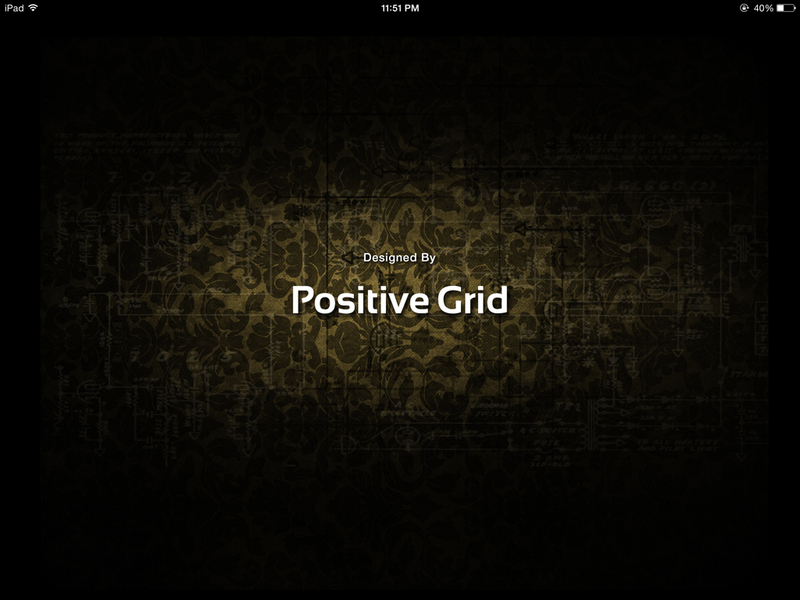 I can’t wait to see where Positive Grid takes us next. 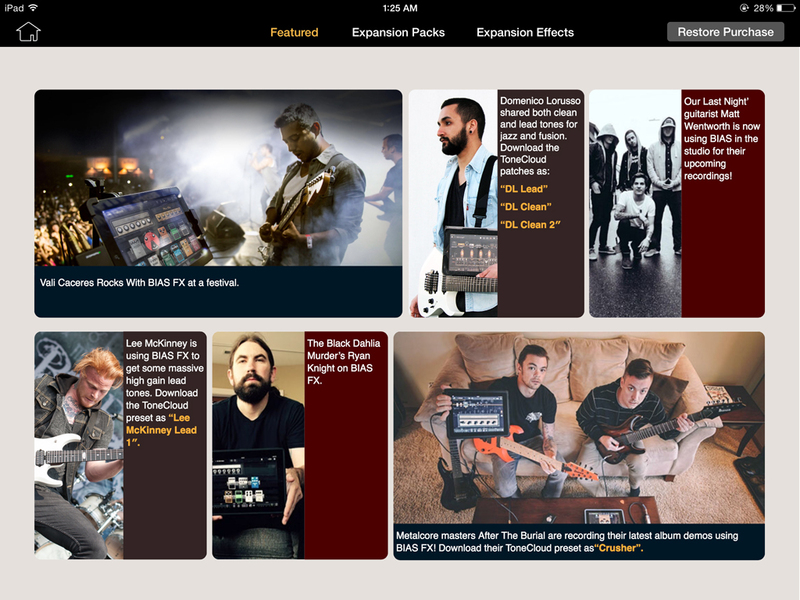 Source: The Bias FX app used in this review was provided by Positive Grid. 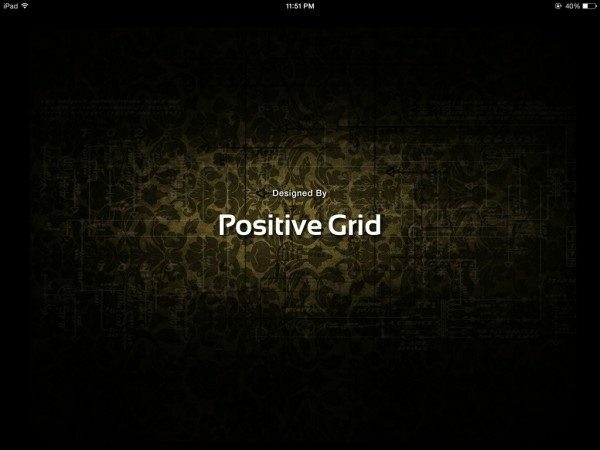 Learn more at the Positive Grid website. Can I ask, is there any sort of latency introduced using this system? In all testing the software maintained extremely low latency. For most of the tests, I did use the Squier USB guitar, so there was no analog to digital step in my chain. At one point, however, I did use the quarter inch plug on the Squier through a guitar interface, and the sound was exactly the same, also with the same very low latency. 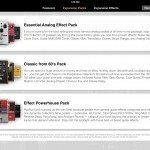 I have had the most disappointing experience with Bias FX pro and their customer service! Being in canada i spent quite a bit to get it and then experienced dropouts, crackles and weird noises. Running Line 6 UX2 through a very powerful mac, both standalone and vst were the same.Reported it and received hugely delayed responses (due to a reporting issue on their website apparently)! They asked me to try a different interface so used a focusrite 2i2 with the same issues. I was upset and casually asked if there was a refund policy, got it back very quickly but lost 20 bucks in the process due to exchange rate changes. No solutions given, no alternatives, just a refund. I would not buy a pro version if i didnt wwant to use it!!? Not saying stay away from this cos it’s an awesome plugin, but the experience is one id like to fully forget. 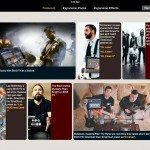 This is not a review of the Bias FX Pro plugin for Windows and Mac computers. 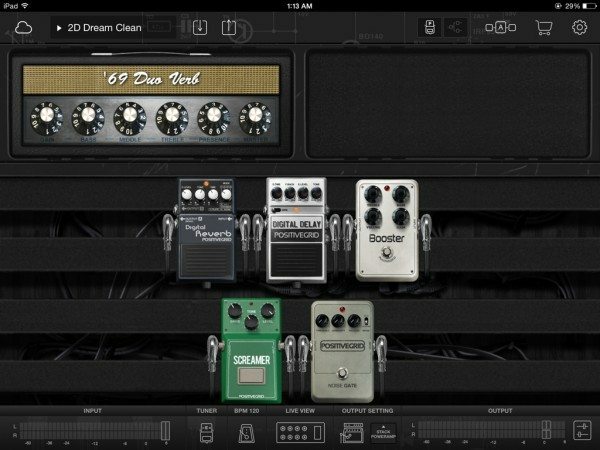 This is a review of the Bias FX amp-and-effects processor app for iPad. – What?? The presets switch terribly slow! There’s a random click/pop sound in the moment of switching! There’s a small fade out/in between presets! The CPU load is 25-30%, no other software running, low latency mode ON. What kind of live usage does it suppose? Slow ballad in 40 bpm? ?